Access is through our secure cloud based Control Panel. All your data kept in one place. 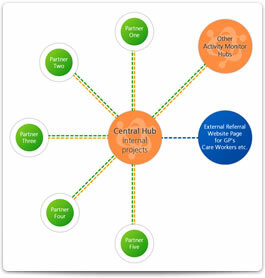 Keep track of all your clients history and their associated projects'. Report on all your activities and outcomes. No restrictions on staff access. Administrators - can add, edit and delete all parts of the system including defining projects and lists of standing data that will be used throughout the system. Staff - have access to view all staff and volunteers and add, edit and delete clients and assign clients to projects. Volunteers - only have access to clients and the ability to assign projects to clients. Apart from holding all the key details for your staff and volunteers the fundamental activity is recording your clients and linking them to projects. There are no restrictions on the number of staff that use the system and you can assign any number of staff members or volunteers to the system to input data about your clients and projects. Activity Monitor helps you communicate with your clients by the use of mailshot email system and SMS text services. Within our software you are able to bulk send SMS texts or email to your clients, this can be useful if service dates have changed, promoting special events or reminding clients of important appointments. Using Portals and Partnerships every organisation Portal can pass referrals onto other local organisations that provide services that they themselves do not. This process is done securely for Activity Monitor users. It is possible to refer a client directly from your Activity Monitor to another organisation that is also using Activity Monitor. The second organisation (partner) receives notification of an incoming referral and is able to either match the client to one already in their system, or add as a new client. This is done directly on our secure server; the data never goes into the outside world and is instant. The partners run a smaller inexpensive version of Activity Monitor and if they wish can expand Activity Monitor as they grow. There is also the option to have a secure area for other third parties like GP’s and Care Workers to log into, where they can refer people to the hub. This would obviously need to have some form of communication between you and the third party so they are aware that the system exists. You will also have the ability to refer a client onto other Activity Monitor Portals who have projects and services better suited to the clients’ needs. The main purpose for Activity Monitor is to produce accurate reports quickly and efficiently. By producing reports instantly within any date range gives your funders the information they need and helps to secure any new funding application. For AgeUK clients Activity Monitor comes with the AgeUK I&A enquiry codes as standard at no extra cost and at the click of a button provides I&A reports within any date range. All your data is held on our secure servers and backed up on a daily basis, you will have the option within Activity Monitor to download your data as an Excel spread sheet for further analysis and chart generation, giving even greater detail to your reporting.